Its sad on the part of Microsoft to not making Microsoft Vista a bug free operating system. Microsoft has sold tonnes of copies over the world and the customers aren’t happy. Well if Microsoft can’t help you with those bugs, a small application called FixWin 1.2 can. So what exactly are we talking about? We are talking about the notorious bugs and errors that actually force you to re-install the Operating system. 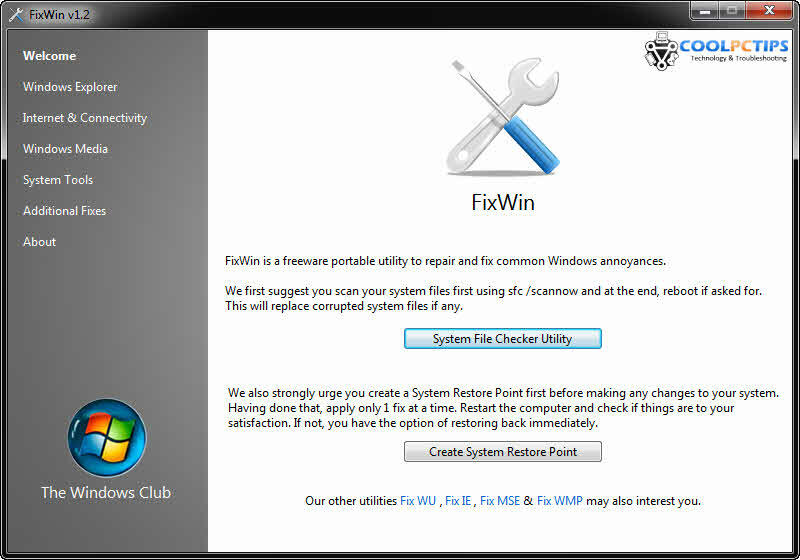 FixWin is a completely freeware software utility that’s will to help you fix the most common problems in Windows, including Windows Explorer, Internet Explorer and Windows Media Player and other 50 + issues with just one solution, FixWin is the Windows Doctor we all have been waiting for. What are those problems that FixWin 1.2 is built to solve? 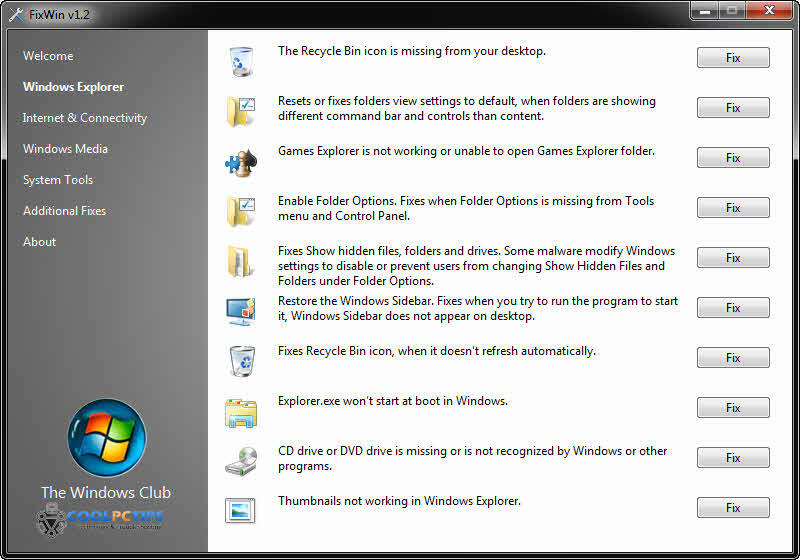 -Fixes the bug where the Recycle bin cannot be emptied normally. -Fixes the error where the right click drop down doesn’t appear in the Internet Explorer browser dealing with contextual menu that seems to be disabled by the Windows. -Fixes the error dealing with issues where the Windows Media Center cannot update the database. -Fixes the bug where Windows doesn’t prompt you with a confirmation dialogue box while deleting certain files from your computer. -Fixes several common bugs that involves system process management through task manager. -Fixes several common bugs that involves Command Prompt. -Fixes several bugs that involves Registry editor. And many more errors. Now if you are one of those unfortunate Windows Vista users, you know you have experienced one of those problems. So go ahead and download FixWin and get rid of those windows bugs that a software giant like Microsoft couldn’t get hold of. – Perform the scan, the scan takes up to several minutes. This is going to be a tedious process so make sure other applications are closed and your CPU usage is at minimum. Once the scan is complete you can now apply the changes. – Apply the changes, don’t worry FixWin 1.2 has a dedicated feature to create a restore point. In case of any disruptive effects you can just revert back to the previous restore point to get back your system to its original point. Note: Windows 7 users should need to run the app as an administrator if you need to apply the changes. The app relies on heavy, handy approach giving you the power to fix the errors based on individual categories like Windows Explorer, Internet and connectivity, Windows Media, System Tools and Additional Fixes, each having its own unique fixing tools and capabilities. The best thing about FixWin is that everything is set right in front of you, fixing such big errors are done as easy as by clicking a button. The interface is so simple to understand and simple to use. FIxWin 1.2 gives to its users is the freeware license which makes it so much better and trustworthy.